I immediately thought late as these ones many flower late Spring/Summer but as we are now nearing Winter maybe they are early? What is it - other than beautiful? These are called a Bottlebrush... because of its liking to a bottle brush, botanical name is a Callistemon. It is an Australian native. Exactly as seen in Porto, Portugal. I've always thought this was such an interesting flower. Never seen one like this before, it's very pretty! Very pretty. That red sure pops out. I was reminded of a "kiss" left on a window or mirror... Neat. That is a most unusual flower, but very pretty. Pretty! They look like flowers I just saw near Kilauea in Hawaii. 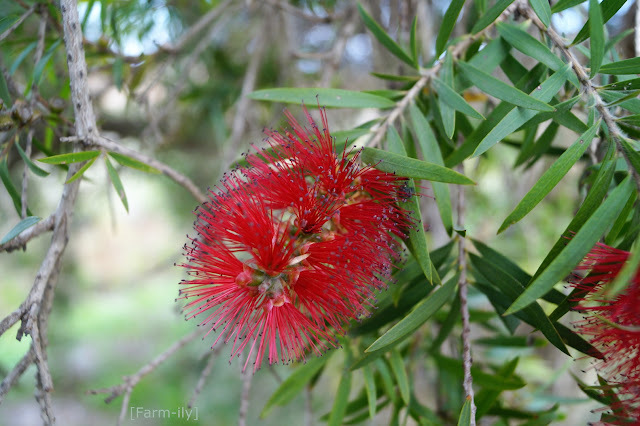 The bottle brush and lovely sight to see.